Northwest History: Was Grandpa a Scab? Note: Are you a westerner with ancestors from Missouri? The following guest post from Jarod Roll of the University of Sussex might explain your family tree. Roll was a student of mine back in the day at Missouri Southern State University in Joplin, where he developed an interest in the labor history of the region. The following post comes from his current research on the use of strike breakers in the mining west. Mine owners in Idaho’s Coeur d’Alene district ran a remarkable classified ad in local newspapers in June 1899. They needed 1,000 miners to work in their silver and lead mines. What job creators, you might think! But these were not new jobs. In May the mine owners, with the help of the state government and federal soldiers, had imprisoned most of the men who had previously dug the district’s metals in the infamous bullpen. 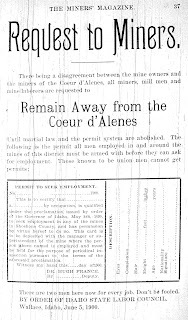 In April the Coeur d’Alene locals of the Western Federation of Miners had gone on strike for union recognition and higher wages in the Bunker Hill & Sullivan mine in Wardner. While what happened is disputed, an April 29 union rally ended with the destruction of the Bunker Hill & Sullivan mill by dynamiters. The authorities quickly lowered the boom on the union. Governor Frank Steunenberg declared martial law, President William McKinley dispatched federal soldiers, all known union members and suspected radicals were detained without charge, and the military authorities instituted a permit system that effectively blacklisted foreign-born and union miners from working in the Coeur d’Alene. Such effective union-busting created a problem, however. Who would work in the mines? Help wanted! WFM, Joplin was the place to go. Joplin’s miners were the best strikebreakers money could hire. 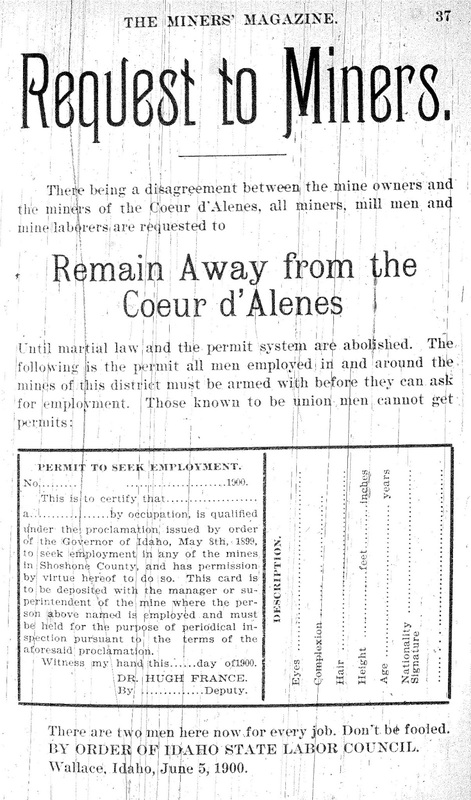 Hundreds of Joplin miners took the offer of employment in Idaho. By late summer, their work had brought most of the mines back into production. Their labor not only reinforced the owners’ heavy-handed union-busting strategy but also encouraged them to permanently replace the foreign-born miners of the WFM with native-born, non-union men. What had been a majority immigrant workforce in 1898 was two-thirds native-born American in 1901. The Joplin miners also benefited Strikebreaking paid good wages! Many of the Joplin miners stayed on in Idaho. In 1904, for example, the owners’ employment agency reported that over 300 Missourians worked in the mines at Burke and Wallace, over 26% of the workforce. Some of the Joplin men went back to Missouri. Albert Torr, for example, used his earnings from strikebreaking to buy an interest in a Joplin mine. Others continued strikebreaking. In 1903, over 100 Joplin miners left Idaho to take strikebreaking work in Cripple Creek, Colorado. I wish I was in Joplin, in Joplin down in Mo. . . .
His soul it went a-scooting to Joplin, Joplin, Mo. To the land of scabbing miners in Joplin, Joplin, Mo. The mine owners got their 1,000 miners from Joplin in the end. Many of them stayed in Idaho. If you live there, look at your family tree. Do you have any ancestors from Missouri? If so, there is a good chance that they were scabs. Jarod Roll teaches American History at the University of Sussex in Brighton, England. 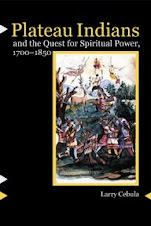 He is the author of Spirit of Rebellion: Labor and Religion in the New Cotton South and coauthor of The Gospel of the Working Class: Labor’s Southern Prophets in New Deal America. He earned his BA at Missouri Southern State University in Joplin, Joplin Mo. Mullan Road Conference Next Weekend!